Adorable little blonde girl with augur curls wears whote dress with blue trim. Applied lace is in wonderful condition. 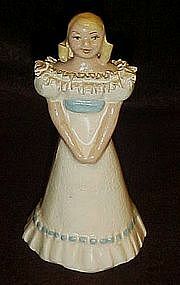 She Measures 5 1/4" tall/ She is in overall great condition with a glaze skip on her bow. MArked with a hand painted H.S.